You now have the unique opportunity to have File Explorer with Photo Manager Standard Edition and Keyboard Pro all in one package. Turn your Pocket PC into a Digital Photo Album. Resco Photo Manager has ability to quickly display images of file formats: RAB, BMP, 2BP, JPG, JPE, JPEG, GIF, PCX, PCD, TIF, TIFF. Action button, or stylus manipulation, zoom, rotation, slide show and many other fantastic features make this product #1 in its field. 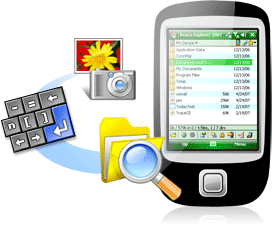 This is a powerful file management utility for your Pocket PC. It implements all standard features such as file/folder manipulation. Thus, you can copy, move or delete files, create folders, run programs with arguments, and search for files or folders.